Remember to take your pills with contextually relevant alerts. PillAware is the user-friendly app for daily pill takers. PillAware is an app the lets you track the pills you take, and reminds you when you need to take them. What makes PillAware special is the technology behind the task. Using advanced iBeacon technology, PillAware can alert you when you get close to your meds, without the battery drain of GPS. A lot of us have to take pills on a regular basis, and it's hard to remember to do that each and every day. Medicine compliance is a serious issue that costs people both money and health. There are a lot of pill reminder apps out in the marketplace. Most of the existing apps rely on users to enter massive amounts of data that is essentially useless to collect. PillAware focuses on the data that is important to the experience of remembering, and enables you to remember at relevant times and places. 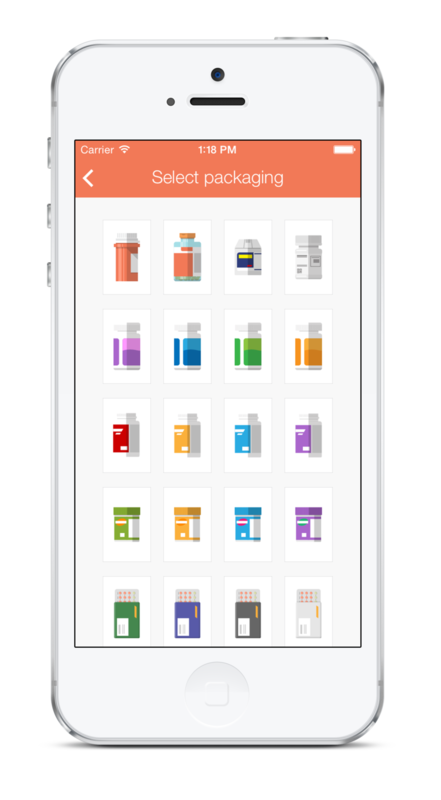 Lots of apps want to collect everything from who prescribed the medicine to what symptoms a user takes it for. The reality is, users have pill bottles that contain all the info they need about who prescribed the medicine and why they're taking it. People that take multiple meds likely have a pill sorter box that lines up their week/day. The problem isn't in keeping that data somewhere, or knowing what pills to take, the problem is reminding you to open up that pillbox. PillAware does three things to remind you to take your pills. First, every day an icon badge shows up on PillAware that has the number of meds that you need to take that day. This is great for people who like clean inboxes. The badge is a reminder every time you look at your phone that you need to do something. Secondly, PillAware has a reminder alarm you can set. This is a common feature in pill reminder apps. Lastly, you can purchase an iBeacon and use it with PillAware for contextually relevant reminders. 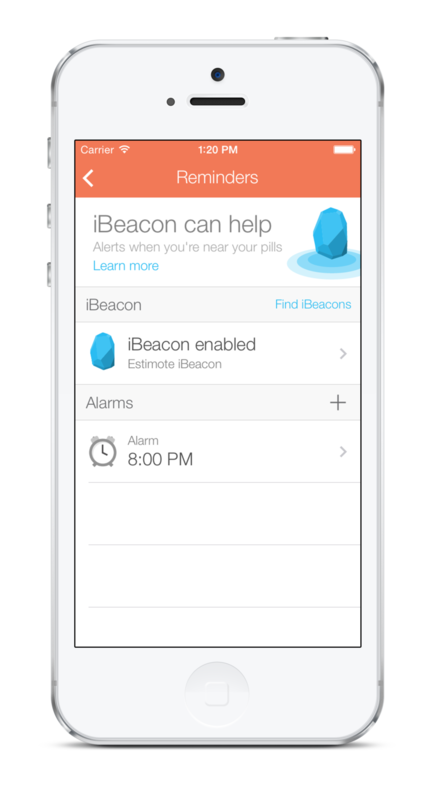 iBeacon allows PillAware to send an alert out when you come in range of the iBeacon. Additionally, when you turn on your device's screen, iBeacon checks to see if you are still in range. PillAware uses an intelligent algorithm to determine when to alert you based on location. The result: you're near your pills when you're reminded to take them. Where do I get an iBeacon? Currently, PillAware only supports Estimote iBeacons. Since iBeacons are not designed to be manually added by users, PillAware relies on the consistent UUID of Estimote beacons to detect and pair these beacons with your iOS device. You can purchase Estimote beacons from their website, and in future updates we will support additional brands of iBeacons. Thanks to the magic of advertising, we can distribute this app to as many people as possible by making it free. We're looking to release an ad-free version in the near future. 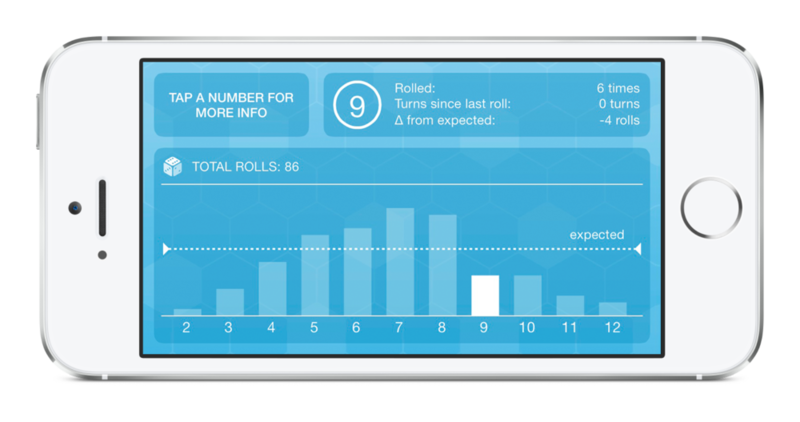 an iOS app that helps you keep track of dice rolls, Dice Tracker makes statistics and analysis intuitive, easy, and fun. 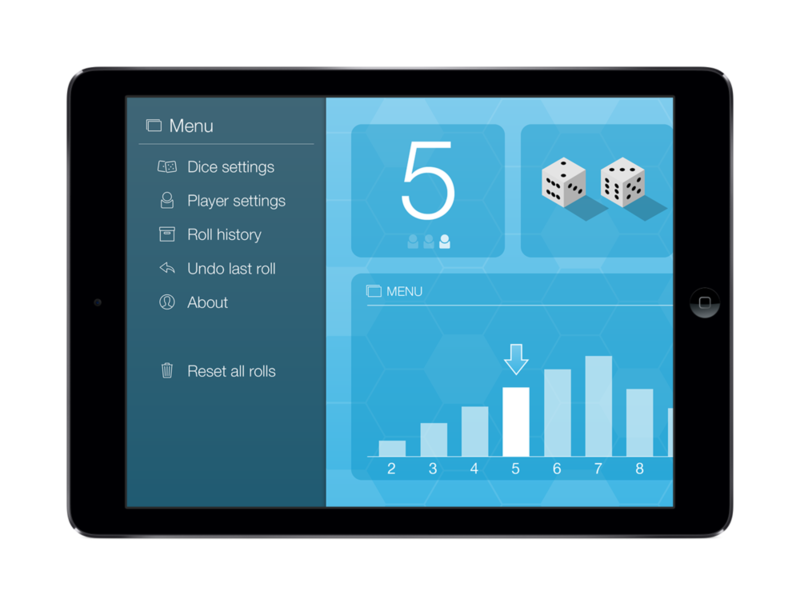 Dice Tracker is an app that lets you create and track dice rolls from your iPad. Bringing statistics, board games, and technology together, Dice Tracker lets you see what rolls are most common, and what rolls should be rolled more often. Using an animated, interactive bar chart, you can explore the dice distribution for your favorite board games. Ideal for fans of Settlers of Catan, Dice Tracker helps put the game in perspective. Additionally, this app offers the ability to purchase in-app dice distributions that normal dice can't offer. Modify your favorite games by rolling more 2's and 12's, or guarantee a fair game by using a stacked dice set that always brings up one of each of the unique dice combinations. My friends and I enjoy playing a game called Settlers of Catan made (by Mayfair games). I have played the iOS version of the Settlers game several times, and I always enjoyed the ability to pull up roll statistics and make sure that the dice are being honest. One day my friends and I were playing the real life board game version, and I noticed how much I missed the dice tracking features built into the iOS game. Additionally, I thought it would be great to have modifiers on the dice. Now when my dice roll doesn't come up, I can prove exactly how unfair it is. I created every element about the app, including the graphics, code, and iTunes listing. If you have trouble with the app, or you have feedback about features you'd like to see, please contact me using the form at the bottom of this page. The latest update includes a revamped UI and refreshed visuals. Tapping on the dice now rolls them, and a menu button provides access to all of the app's functions. I did remove a few items that were proving unwieldy, including shake to undo (no one wants to shake an iPad) and the "Turns since last rolled" statistic. To compensate, I've included undo in the menu (much easier to use) and I have improved the roll history screen. Dice Tracker is an app that lets you create and track dice rolls from your iOS device. Bringing statistics, board games, and technology together, Dice Tracker lets you see what rolls are most common, and what rolls should be rolled more often. Using an animated, interactive bar chart, you can explore the dice distribution for your favorite board games. Ideal for fans of Settlers of Catan, Dice Tracker helps put the game in perspective. With the iPhone version, you can roll dice distributions that normal dice can't offer. Modify your favorite games by rolling more 2's and 12's, or guarantee a fair game by using a stacked dice set that always brings up one of each of the unique dice combinations. ith Dice Tracker for iPhone, I redesigned the user interface of the iPad app and made everything iPhone-sized. I also managed to keep most of the original features, and even added a few new items. Dice Tracker now supports both portrait and landscape orientations. 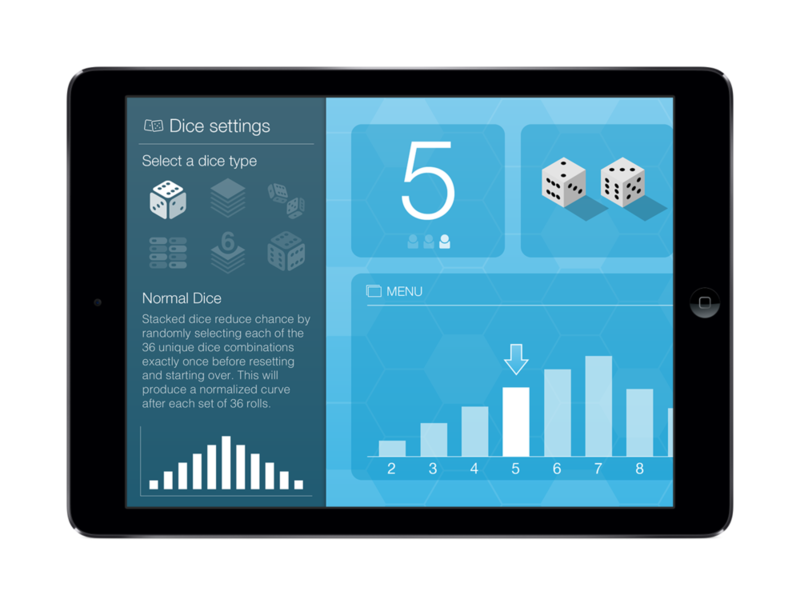 Roll dice in the portrait view, and rotate the device to get an interactive and animated chart so you can explore your dice distributions. One of the biggest challenges was keeping true to the principles the brought Dice Tracker to life in the first place. There are plenty of dice tracking apps on the app store, but none give you a real-time chart view as you roll the dice. Also, I wanted to keep the player indicator, dice readout, and a dice image all on the screen at the same time. Given the smaller real-estate I had to work with, I could either start cutting things, or figure out a way to make them all fit. I'm pretty happy with the result, and I hope you are too. And this one is totally free too? Yup, absolutely free. No ads, no annoying pop-ups asking you to review or rate the app. Nothing. You're welcome. Micropod (working title) is an upcoming iOS game created, designed, and developed entirely by myself. It is a tower defense game, which means you defend against waves of "creepers" who are attempting to make it through the maze. Many tower defense games rely on themes and visual action to make the experience compelling. My goal was to create a tower defense game where the user actually feels like they are a part of the action, not just looking over a map. Each split second decision can make an impact in how the game plays out. Also, I will incorporate "challenges" like you find in iOS titles such as Jetpack Joyride. I've started by making the base visual set and game engine for collision detection, creeper creation, and tower placement dynamics. As the app gets updated over time I will continue to post the latest screen grabs and interaction videos to this site. This is an independent developer project, published by myself. I came up with the concept, designed all the media, and wrote all the code. This project started for me as a learning exercise to teach myself iOS programming and Objective-C. However, as this project has developed it has turned into a viable game concept that I intend to publish to the iOS app store. Most the the remaining code left to write is in managing details for the experience. But there are several unanswered questions to be taken care of before this app goes live in the app store. What is the final title going to be? Is there a story? What will the price point be? Will there be premium content? I'm hoping to get these questions and many others like it answered in the next couple of weeks/months.